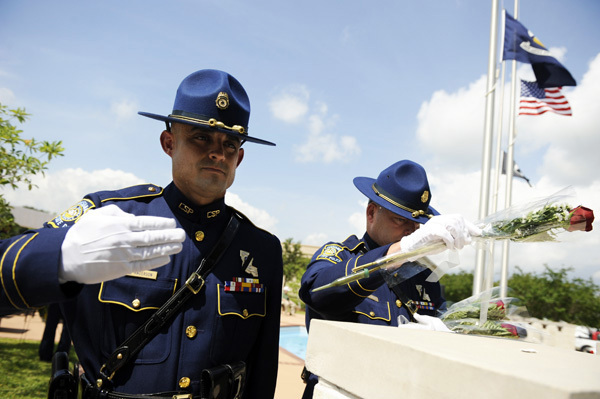 Louisiana State Police is an organization with an incredibly rich history. 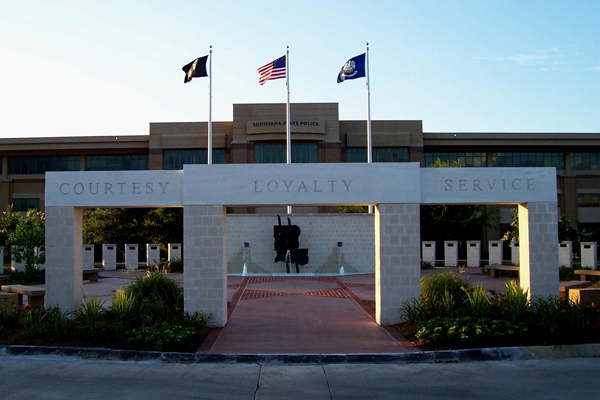 Our motto, "Courtesy, Loyalty, Service," has given us direction and inspiration. As the men and women of this organization prepare for the future, we must reflect on the legacy and heritage left by those who preceded us. 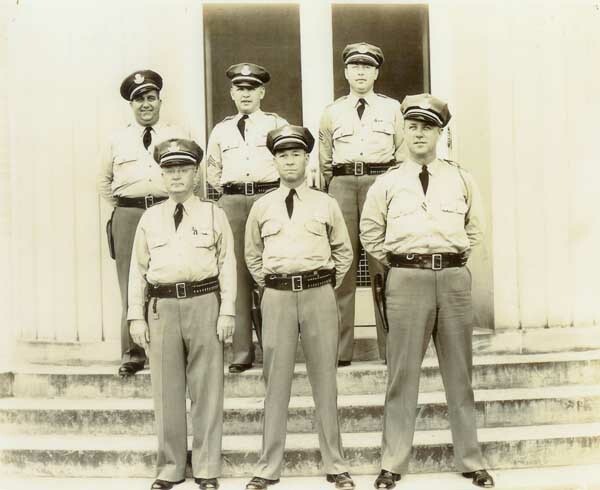 When the Louisiana Legislature passed a bill in 1936 creating the State Police, few observers could have predicted the esteem this agency would enjoy in Louisiana and across the nation. 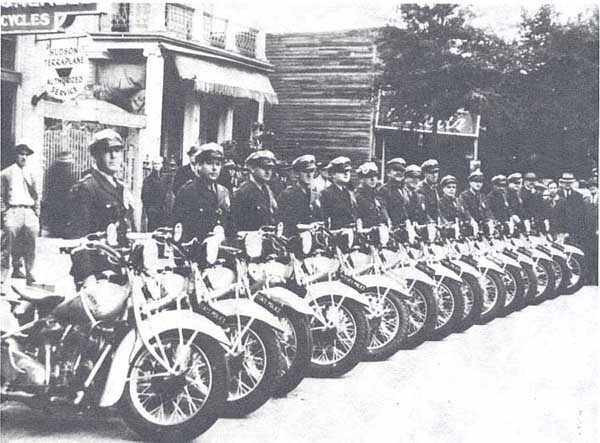 Louisiana State Police has emerged from a highway commission in 1922 with a force of 16 men patrolling the highways on motorcycles to its current status of a state police force of 1022 men and women responsible for all elements of criminal and highway safety interdiction in the state. Louisiana's first attempt at law enforcement on a statewide level came in 1922 in response to the arrival of the automobile. Louisiana had 2,700 miles of roadway and an estimated 102,000 vehicles. The Louisiana Highway Commission was created and given the power to appoint inspectors to enforce laws relating to the highways. The Commission operated with the state divided into ten districts; sixteen officers patrolled the entire state. During the two year period from 1922 to 1924, 114 serious accidents and 18,918 violations of motor vehicle laws were reported. 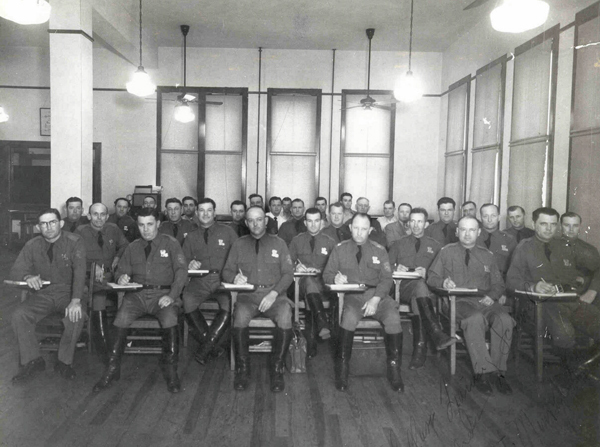 By 1928 the Law Enforcement Division of the Highway Commission was beginning to function as a true state police force. Structural changes were made, dividing the state into three administrative districts supervised by captains. The force had grown to 70 uniformed officers with expanded duties such as managing traffic at large gatherings of people. The officers were also called on in times of emergency such as the "Flood of 1927." The men were commended for their meritorious service in the evacuation of flood victims and patrolling the Mississippi River levees. At this time an additional branch of law enforcement, the Bureau of Criminal Investigation, was established to deal with criminal activity not related to traffic laws. In 1932 the State Highway Patrol was given the authority to carry firearms. 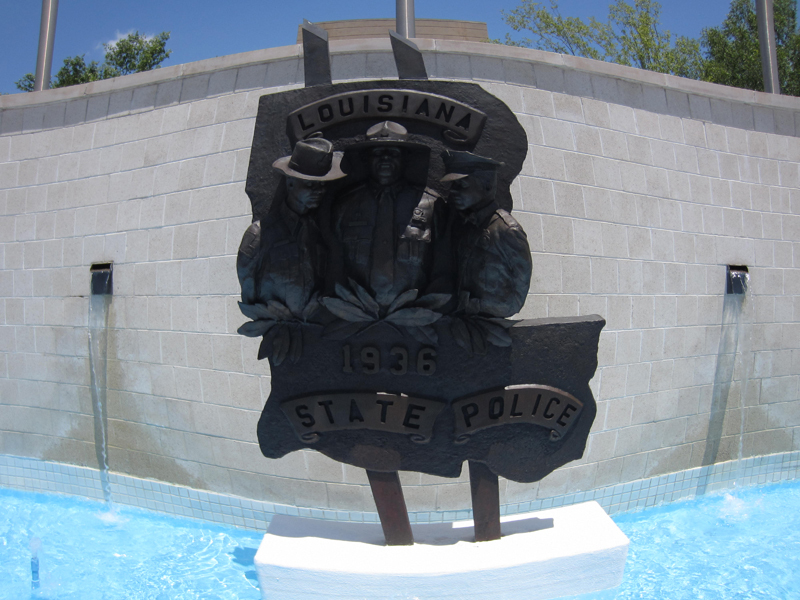 On July 28, 1936, the two divisions of law enforcement were combined to form a modern, well equipped, and well-trained force known as the Louisiana Department of State Police. The department thrived under the direction of an appointed superintendent, General Louis F. Guerre. His goal was to model State Police after J. Edgar Hoover's famed "G-Men." This was accomplished to a great extent with the establishment of a training school and a crime lab. High priority was given to the crackdown on narcotics trafficking. Under Guerre's administration, the state was redistricted into eleven districts. A total of 146 State Police personnel were assigned to the patrol districts, the training school, and the Bureau of Investigation. 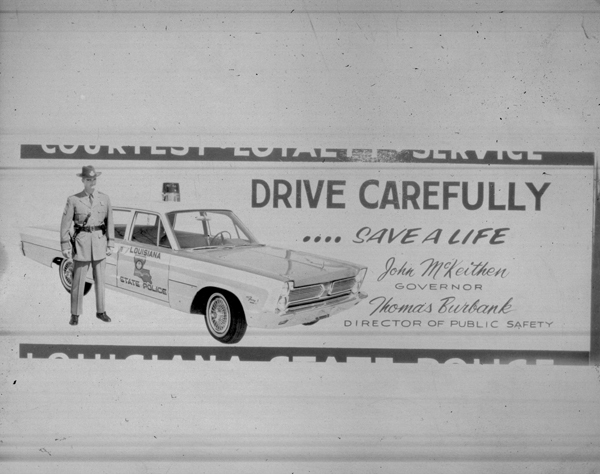 It was during this era that the State Police adopted the slogan "Courtesy, Loyalty, and Service." 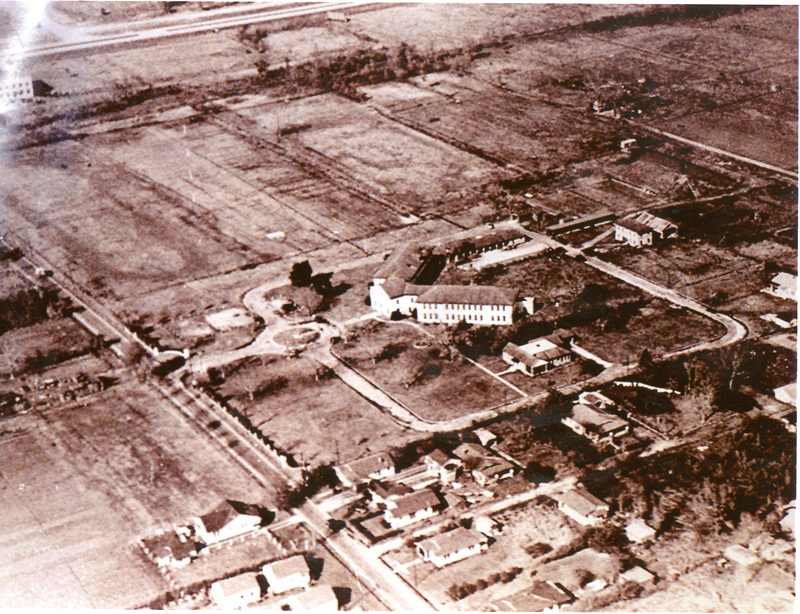 Guerre also established the State Police headquarters at the old prison site on Jaybird Lane (now South Foster Drive) in Baton Rouge. 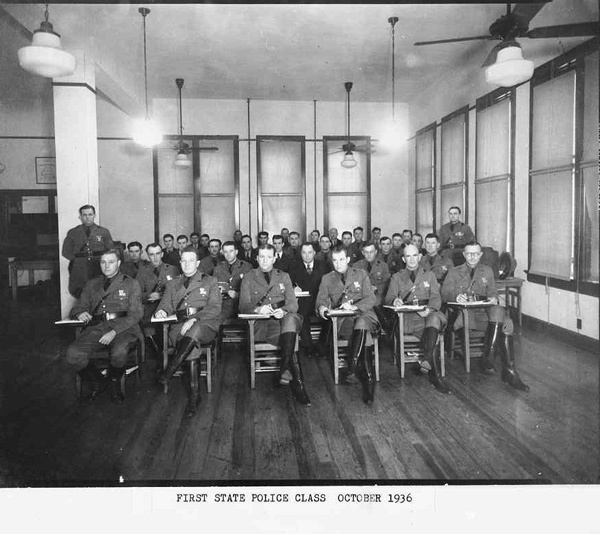 In 1940 The State Civil Service System was established offering "protection from political considerations" to State Police officers as well as other state employees. This legislation, backed by reform governor Sam Jones, was dismantled by Earl K. Long when he returned to the executive office in 1948. State Police would not gain protection under Civil Service again until 1952. 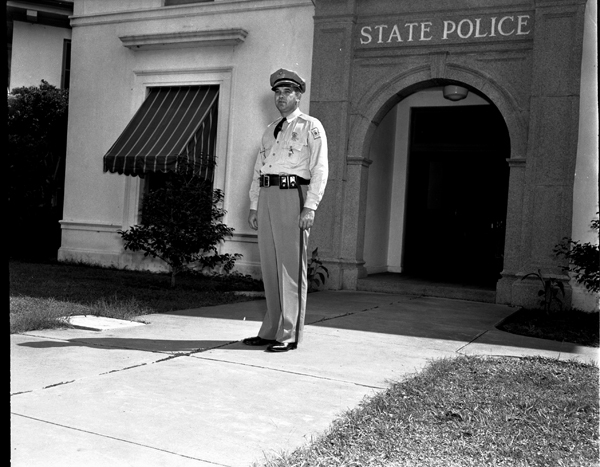 Another major change came about in 1942 when the Louisiana Legislature abolished the Department of State Police and made it a division of the newly created Department of Public Safety. State Police accepted new responsibilities in 1946 when the Drivers License Law was enacted requiring every driver to hold a license for operating a motor vehicle. Prior to this time, only the operators of commercial vehicles, trucks, and buses were required to be licensed. 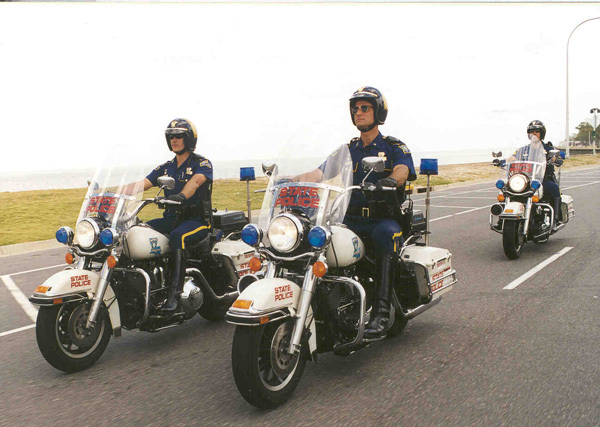 Under the leadership of Colonel Francis C. Grevemberg, State Police added an air patrol to its ranks. This was the beginning of the use of aircraft to track down fugitives, assist in emergency situations, and monitor speeders on the state's highways. At the same time a stock patrol, officers on horseback, was established to remove stray farm animals which might be grazing or wandering along roadways. 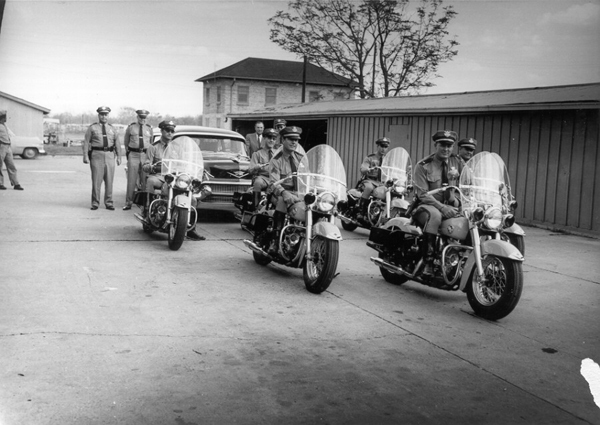 This team of officers would later play a major role in providing security at rock concerts and civil rights marches. During Colonel Grevemberg's administration, Louisiana first experienced gambling raids. This crackdown focused on major syndicate-owned casinos, prostitution rings, bookmaking operations, and even included church bingo games. However, the campaign against gambling and associated vices did not last long. When Earl K. Long took control of the Governor's Office once again in 1956, he announced that State Police would no longer "harass and intimidate the citizens." This attitude against using state troopers in gambling raids prevailed through the administrations of Governors Jimmy Davis and John McKeithen. 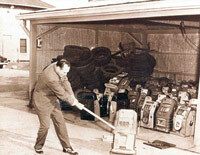 In 1961 the Legislature passed a new law requiring the inspection of all motor vehicles. Then in 1962, the Legislature enacted a new highway code which established a maximum speed of 65 miles per hour on multilane highways and 60 miles per hour on other highways. Together, these were considered important steps toward improving highway safety. 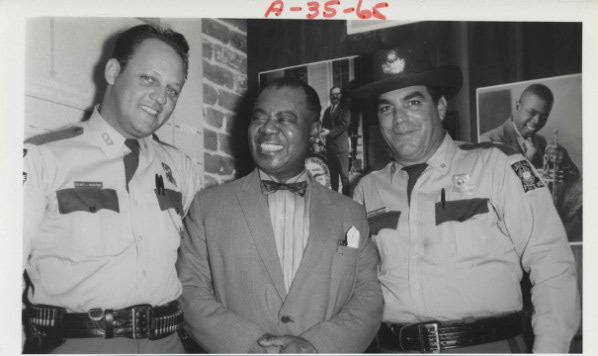 State troopers faced what may have been their most challenging assignment when they, along with the Louisiana National Guard, were called to guard and protect civil rights marchers in Bogalusa. 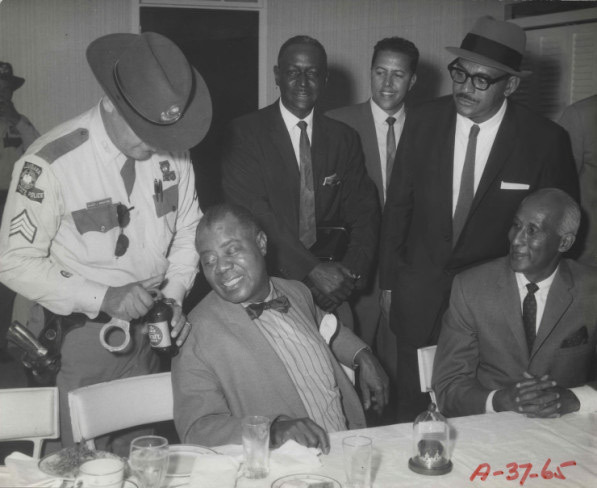 In 1965 and again in 1967, troopers had the task of trying to prevent the violence and bloodshed that had scarred other cities across the nation during the civil rights struggle. 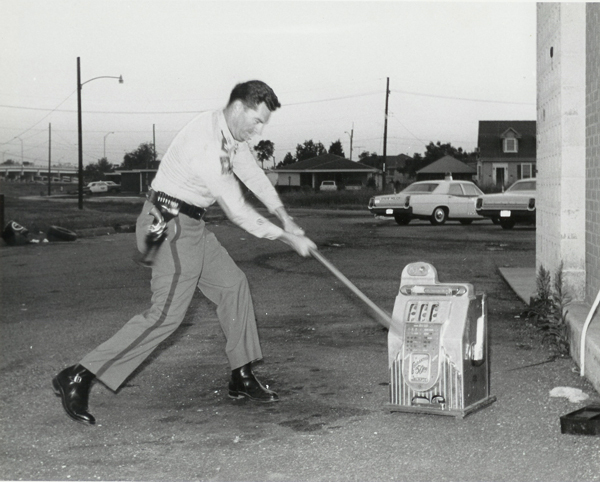 These demonstrations, in addition to others occurring on college campuses across the country, prompted State Police to add "Big Bertha" to its armory in 1968. "Big Bertha" was a homemade anti-riot armored vehicle weighing thirteen tons and costing $22,000 to construct. Under the leadership of Colonel Stanley Berthelot, many changes took place in the department, most of which were instituted in 1969. 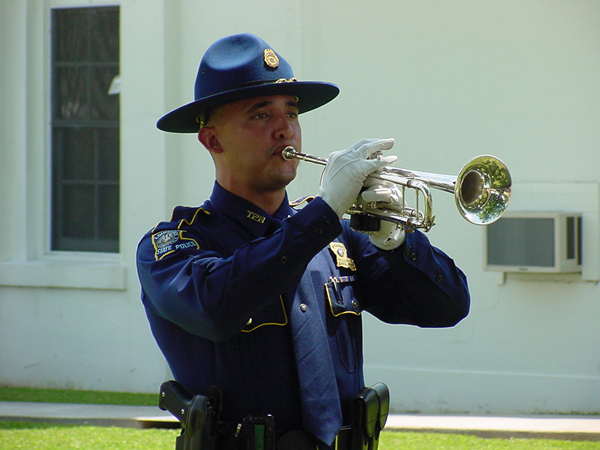 The Louisiana State Troopers Association was created in an effort to improve the quality of working conditions, to increase salaries, and to serve as a means to address troopers' major concerns. Also, at this time State Police increased the efficiency of its air patrol. The airplane was augmented by three helicopters, providing more versatility. Colonel Berthelot also added a Tactical Unit to the force at headquarters and each of the eleven troop districts. This was an entirely new concept for State Police, allowing the department to respond to emergency situations which were beyond the capacity of local police to handle. In 1971 the Narcotics Education Unit was established to enlighten young people and their parents about the dangers of drug abuse. The "Festival of Life," which attracted 60,000 concert goers in June of 1971, proved that drug use among young people had become so widespread that it was impossible to arrest every offender. 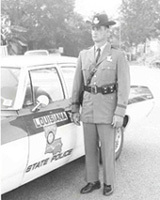 In 1972 Colonel Donald Thibodeaux was appointed by Governor Edwin Edwards as Superintendent of State Police. Colonel Thibodeaux led the department through many reforms, most of which are still in effect today. He began the reorganization of the State Police structure by adding three regional offices to supervise the eleven troop districts. During Thibodeaux's administration, personnel in the department increased by 235, and in 1976 Louisiana recorded its lowest highway fatality rate in history, 4.1 deaths per one hundred million miles. 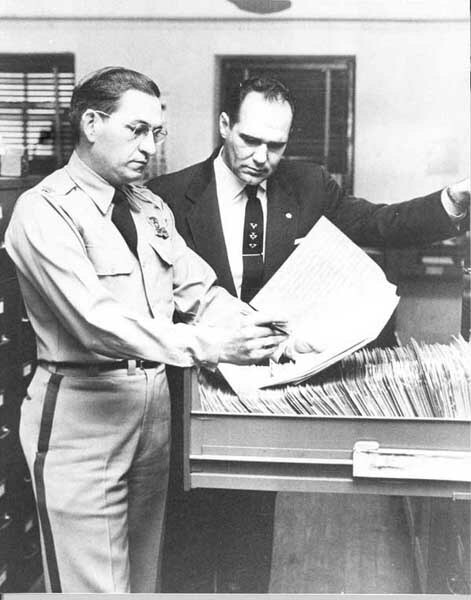 Among the new sections formed by Colonel Thibodeaux were the Internal Affairs Unit, which investigates any complaints lodged against members of the State Police; the Merit Board, which reviews the applications for promotion in the department; and the Explosives Control Unit, which oversees all matters concerning explosives and investigates incidents involving suspicious devices. Colonel Grover "Bo" Garrison took office in November 1976 and was reappointed to the position in 1980 by Governor Dave Treen. Garrison was one of only two Superintendents of State Police to survive a change in administration. 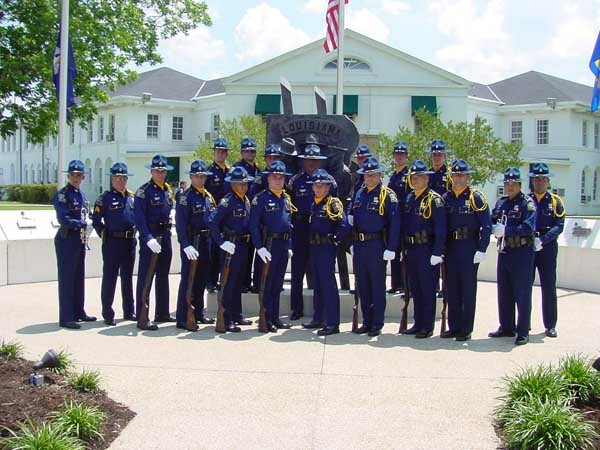 Colonel Garrison led State Police to its highest staffing level of 960 troopers in 1984. Many factors contributed to this tremendous growth, including the availability of funding and increased emphasis on narcotics enforcement and countering drug smuggling. Smuggling had become a tremendous problem in Louisiana during the late 1970's and early 1980's as a result of increased federal patrols along the Florida coast. This higher concentration of officers in the Florida area caused smugglers to shift their operations to ports along the inner Gulf Coast. State police still focus a great deal of attention on narcotics enforcement today. After 1984 the economic picture changed dramatically for Louisiana. Oil prices plunged worldwide and South Louisiana saw a dramatic shutdown in oil production. The loss of oil and gas revenues caused state government to begin trimming its operation. Although the Department of Public Safety was affected by the economic crunch, it began to take on added responsibilities. In 1986 the Charitable Gaming Unit was formed to regulate bingo, raffles, and other charitable fund raisers. At the same time, the Racing Investigations Unit was put into place to maintain the integrity of pari-mutuel racing in the state. The Motor Carrier Safety Section was given the responsibility of regulating the trucking industry on Louisiana's highways. 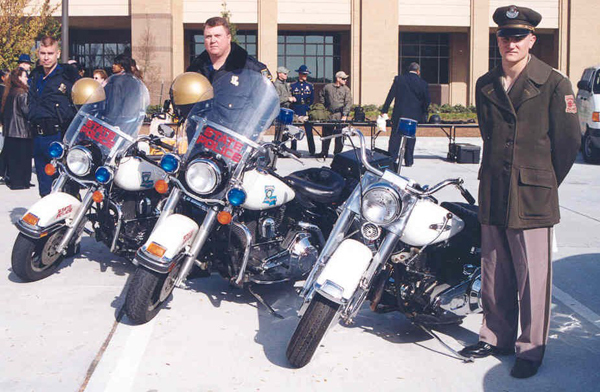 Continued budget cuts in 1988 resulted in the closure of Troop H in Leesville and Troop K in Opelousas and the consolidation of the State Police structure into three regional commands with three troops in each region. Also, the Criminal Investigation Bureau was reorganized and reduced in size, severely affecting investigations. The three regions were given additional responsibilities as narcotics enforcement was moved from headquarters to the region areas. 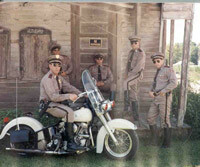 As the 1980's came to a close, the Louisiana State Police was a much leaner organization. Through budget cuts, the department was able to maintain its many responsibilities with manpower of 650 troopers patrolling the state's highways. In 1992 the department took over a new and much more complex responsibility: riverboat and video poker gaming. 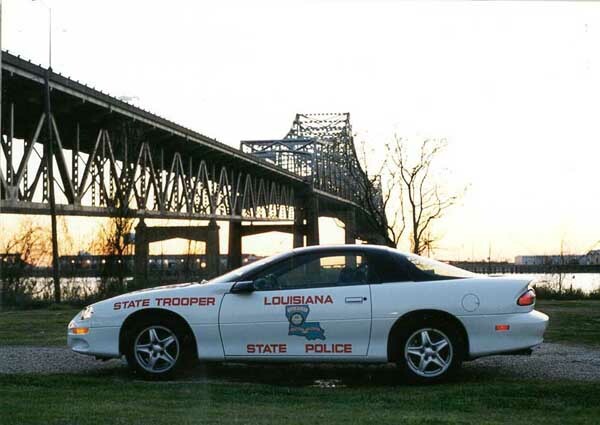 Operating with a small contingency of troopers, the Louisiana State Police began formulating the tough licensing process for all who either wished to own a river boat casino or operate a video poker franchise. Although the task seemed overwhelming, experienced "highway patrolmen" quickly adjusted from law enforcers to regulators. The department began to flourish with new equipment and more manpower as a result of being the chief watchdog of the new gaming industry. With this newly added equipment and manpower, the department was able to take on a different role in law enforcement, that of assisting all law enforcement agencies by using the Automated Fingerprint Identification System (AFIS). AFIS provides law enforcement with a tool that instantly identifies a person through his fingerprints which are imperative to criminal identification and arrest. Also, a totally updated 800 megahertz radio system was implemented which allows multi-agency or jurisdiction coordination among all law enforcement agencies. 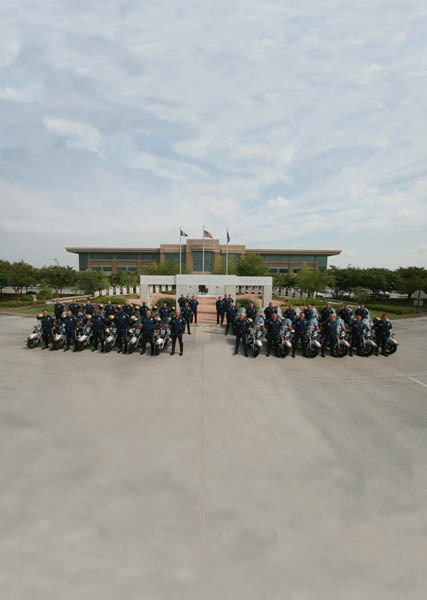 With the successful completion of several academy classes, the purchase of up-to-date technology such as AFIS, and the growth of the Bureau of Investigation, the Louisiana State Police began the process of regaining much of the strength lost as a result of the budget cuts of the late 1980's. In 1996 Mike Foster was inaugurated as Louisiana’s 53rd governor, and he quickly appointed W. R. “Rut” Whittington to the Superintendent’s position in January of that same year. Foster would be an aggressive supporter of State Police. Colonel Whittington realigned the senior command level in the organization by creating several unclassified Deputy Superintendent positions, implemented ethics training throughout the agency, and emphasized a shift in cadet training. The new approach to training was based on emerging innovations in adult education and focused on improving the individual problem solving skills of all commissioned personnel. Whittington retired in 2000 but left behind an agency which had been greatly improved and influenced by a supportive governor. 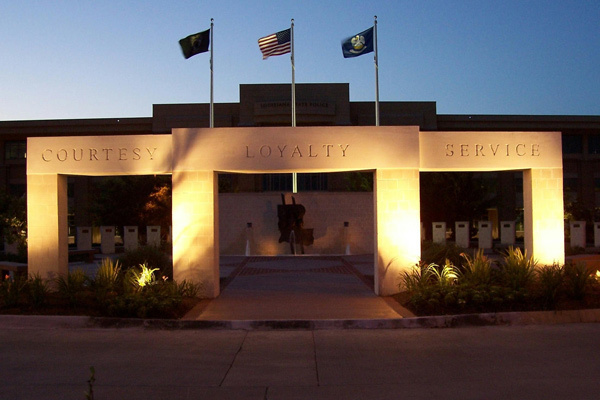 After those prosperous years, the department was faced with severe budget and manpower cuts shortly after the installation of newly appointed superintendent, Colonel Terry C. Landry in the summer of 2000. Colonel Landry faced many challenges during the first several months of his administration. However, under his leadership, the department remained strong and the members aligned themselves with Colonel Landry in his resolve to raise the Louisiana State Police to levels that surpass the expectations of the state's citizens. The State Police and Department of Public Safety headquarters relocated to a new, 165 acre compound on Independence Boulevard in 2002 after the compound on North Foster Drive was transferred to the Baton Rouge Community College. On January 12, 2004 Colonel Henry L. Whitehorn was sworn in as Deputy Secretary of the Department of Public Safety and Superintendent of the State Police. On July 19, 2007 Colonel Stanley Griffin was sworn in as Deputy Secretary of the Department of Public Safety and Superintendent of the State Police. On January 14, 2008 Colonel Michael D. Edmonson was sworn in as Deputy Secretary of the Department of Public Safety and Superintendent of the State Police. On March 25, 2017, Colonel Kevin W. Reeves was appointed the 26th Superintendent of the Louisiana State Police. He also serves as Deputy Secretary of Public Safety Services. Interview: Francis C. Grevemberg Interview: David J. Keyser, Sr.